Beard, Mary. The Fires of Vesuvius; Pompeii Lost and Found. Harvard University Press, 2008. Berry, Joanne. The Complete Pompeii. Thames and Hudson, 2007. Ciarello, Annamaria, Ernesto De Carolis (eds). 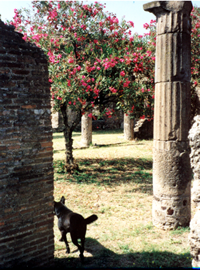 Around the Walls of Pompeii. Electa, 1998. Coarelli, Fillippo, Alfredo Foglia, Pio Foglia. Pompeii. Riverside Book Co, 2002. Cool, Hillary. 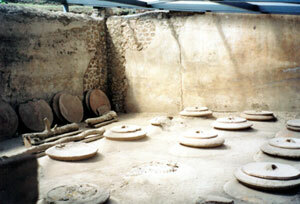 Eating and Drinking in Roman Britain. Cambridge University Press, 2006. Curtis, Robert. Ancient Food Technology. Leiden; Brill, 2001. “Umbricius Scaurus of Pompeii”, Studia Pompeiana and Classica in honor of Wilhelmina Jashemski, vol 1: Pompeiana. Ed. Robert I. Curtis: New Rochelle, NY, Caratzas, 1988. Dobbins, John J, and Foss, Pedar W., eds. The World of Pompeii. Routledge Taylor and Francis Group, 2007. Eschebach, Liselotte. Gebaudeverzeichnis und Stadtplan der antiken Stadt Pompeji. Bohlau, Cologne, 1993. Giordano, Carlo, Isidoro Kahn. The Jews in Pompeii, Herculaneum, Stabiae, and in the Cities of Campania Felix. Bardi Editore, 2001. Grainger, Sally. Cooking Apicus: Roman Recipes for Today. UK Prospect Books, 2006. Grant, Mark. Roman Cookery: Ancient Recipes for Modern Kitchens. Serif Publishing, 1999. Gregory, Ian N. A Place in History: A Guide to using GIS in Historical Research. Oxbow Books, 2003. Guzzo, Pietro Giovanni. Pompei Ercolano Stabiae Oplontis. Electa Napoli, 2003. Guzzo, Pietro Giovanni, Antonio D’Ambroise. Pompeii. L”Erma di Bretschneider, 1998. Guzzo, Pietro Giovanni (Ed). Tales from an Eruption Pompeii Herculaneum Oplontis, Guide to the Exhibition. Electa, 2003. Harris, Judith. Pompeii Awakened; A Story of Rediscovery. I.B.Tauris & Co, Ltd. 2007. Jashemski, Wilhelmina. The Gardens of Pompeii, Herculaneum and the Villas Destroyed by Vesuvius. Caratzas, New Rochelle, NY, Vol I, 1979 and Vol II, 1993. Jashemski, Wilhelmina Feemster, Frederick G. Meyer, eds., The Natural History of Pompeii. Cambridge, 2002. Mayeske, Betty Jo. “A Pompeian Bakery on the Via dell’Abbondanza” Studia Pompeiana and Classica in honor of Wilhelmina Jashemski, vol l: Pompeiana Ed. Robert I. Curtis; New Rochelle, NY, Caratzas, 1988. Mayeske, Betty Jo, Robert Curtis, and Ben Lowe, Global Perspectives on Archaeological Field Schools, ed. By Harold Mytum (Springer, 2012). 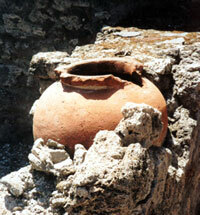 Their article is “The Pompeii Food and Drink Project” in Part IV, Non-Excavation. Mau, August, Pompeii, Its Life and Art. New York, 1902, Reprinted, Caratzas New Rochelle, l982. 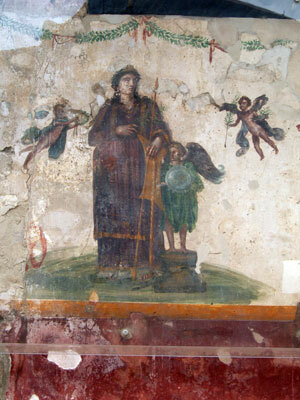 Mazzolini, Donatella, Umberto Pappalardo, Luciano Romano, Domus: Wall Painting in the Roman House. Getty Trust Publications, J. Paul Getty Museum. 2005. Studia Pompeiana & Classica in honor of Wilhelmina Jashemski, Vol I: Pompeiana .ed. Robert I. Curtis. Caratzas, New Rochelle, NY, 1988. Time-Life Books. Pompeii: The Vanished City, 1992. Wallace-Hadrill, Andrew. 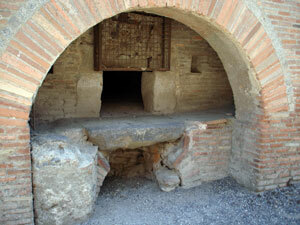 Houses and Society in Pompeii and Herculaneum. Princeton University Press, 1994. Bulwer-Lytton, Edward. The Last Days of Pompeii. 1834; Dolphin Books, 1961 ed. .
East, Rebecca. A.D.62: Pompeii. iUniverse, Inc. 2003. Copyright ©2014 Pompeii-Food-and-Drink.org. All rights reserved.